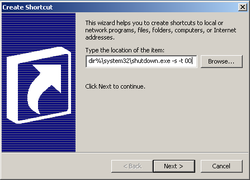 Have you ever wished that you could shutdown Windows directly from the desktop, instead of clicking your way through to the shutdown menu? This simple customization allows you to do it yourself. And, it works just as well for a laptop as it does for a PC! 1. 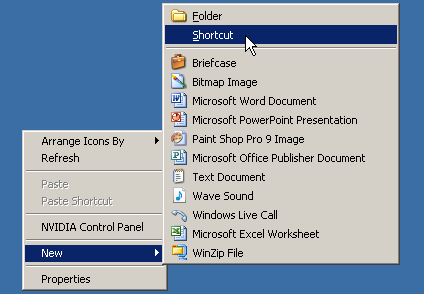 Right-click any blank space on your computer desktop, and navigate to New Shortcut. 3. Click Next to continue editing the shortcut with a name. Renaming it 'Off,' 'Die' or 'Goodbye' won't affect how well it works either. Once you have chosen a name for the shortcut, click OK to exit. 4. Complete this customization by replacing the default icon. 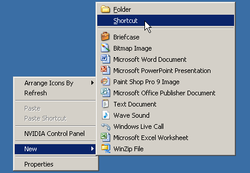 To do this, right-click on the new shortcut, select Properties and click on Change Icon. You will see a pop up notification telling you that the file contains no icons. Clicking on OK should open the SHELL32.dll file. 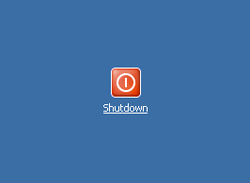 If not, browse to it in the windows\system32 directory. Select the red icon you will see in the lower right-hand corner, without scrolling. You could select a different icon if you want to, but this is the default icon Microsoft uses. After making your selection, click OK to close out both windows. * Many dll and executable files contain icons. 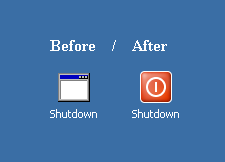 * Use Microsoft's Powertoys for Windows XP (Tweak UI) to remove the 'shortcut to' and the arrow. No versions exist for Windows 7 or 8, to my knowledge. 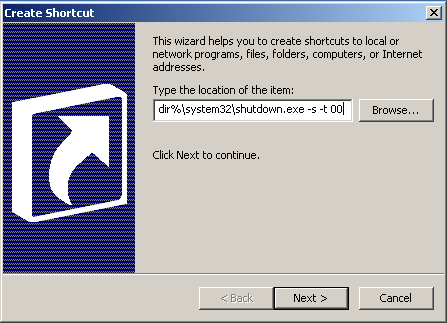 * While adding the -f parameter to the file location (%windir%\system32\shutdown.exe -s -f -t 00) will force all open programs to close immediately, this may cause a Safe Mode prompt on your next boot up, since some programs may not have time to close properly. * If you do not have administrative rights, have someone who does to perform this customization. * If you copy/paste the command string, instead of typing it, the copyright/backlink information will render the shortcut invalid.